Pollution free garbage disposal for Lamphun? At the special task force conference on preventing and suppressing the illegal deforestation in Hod and Mae Chaem districts, Chiang Mai and Mae Sariang and Mae La Noi districts in Mae Hong Son that there were two plots of forest land of 800 and 500 rai respectively in Mae Chaem district that had been severely invaded by illegal loggers. Suwit Kunkitti, deputy Prime Minister has ordered the authorities concerned to find the culprits and bring them to justice within 15 days. 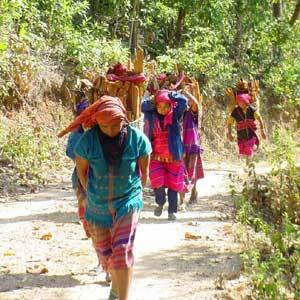 Hill tribe people are still collecting forest products and destroying forests for firewood. At the meeting, there were more than 200 government officials including the provincial governors from Chiang Mai, Lamphun, Lampang, and Mae Hong Son and meeting with Prapat Panyachartrak, Minister of Natural Resources and Environment. Saving the forests will be extended from 4 months to 4 year operations and will be presented as a royal charitable project and to also celebrate His Majesty the King’s 84 year anniversary. The plan is aimed to reforest and promote the hilltribe people to carry out cultivation instead of deforestation. This charitable project will be finished in the year 2007, according to the forestry officials. But is Chonburi down or up? Chiang Mai Governor Pisit Khetphasook, who has been in the position since November last year, will be transferred to become the new governor of Chonburi province, succeeding Sawarng Srisarkun, who will take the post of director-general of the Public Works Department. According to a source close to the governor, he is one of 11 high ranking officials, under the Ministry of Interior, to be transferred at this time. "This action has been ordered by the Ministry of Interior, and will be effective as soon as possible, probably from the first of June," he said. It was reported that the Minister of Interior Wan Muhamad Noor Matha prepared the proposal letter for the transfer of the governors and this would be officially approved by the Cabinet. Another source claimed that Governor Pisit had some personal conflicts with some local people, especially with some of politicians in the region. The new Chiang Mai governor will be Suwat Tantipat, from Buriram province, whose hometown is in Suphan Buri, the home of former PM Banharn Silapa-archa. The United Nations has designated June 5 to be World Environment Day, to encourage people’s consciousness about the environment, and in particular this year the U.N. has a campaign called "Water - Two Billion People are dying for it!" This year has also been named the Asian Environment Year. To mark these events, the Office of Environment, Region 1 (Chiang Mai), together with other state and private agencies will provide a week full of activities from June 1-7, to mark the World Environment Day and Asian Environment Year. Activities will include an environmental exhibition, a seminar, painting competitions, an essay and debating contest and other environmentally friendly exhibits. The main activities will be held at the Chiang Mai National Museum, located near Wat Jed Yod, and Mae Ta Chang water source in Hang Dong district. The campaign "One Village - One Product" extended its product line with the food and medicine exhibition from 17 Northern provinces on May 25 at Thapae Gate. Manorom Sintapaarchakul, a pharmacist at the Chiang Mai Provincial Health Office, said that the Food and Drug Administration in cooperation with the Chiang Mai Provincial Health Office established the fair called "Tasting Northern Food, Enjoy Good Products" to promote a new standard product line of foods and medicines, and also to expand the products’ export ambitions. In the fair, there were many booths, both for display and for sales, all certified by the Food and Drug Administration. The general public and any manufacturers could also receive advice from a number of pharmacists present, or from the Officers from the Food and Drug Administration. They could also have their own products, such as food, medicine, and cosmetics, tested free of charge. Very popular entertainment was provided by local artist, Witul Jaiphrom, plus traditional performances from the Dramatic Arts College of Chiang Mai . Chiang Mai tourism-related businesses can cope with the SARS downturn effect for only 3 months more before facing economic crisis, says the Chiang Mai Chamber of Commerce (CCC) president Jumpol Chutima. He said there are now many businesses that have closed down following the impact SARS has had on the movement of travellers. Tourists still worry about the SARS outbreak. 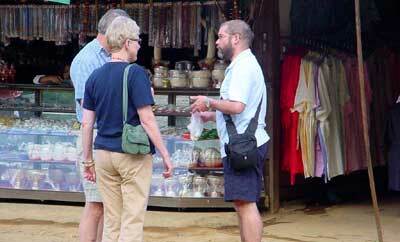 Many tourism-related businesses have closed, due to the reduction of tourist numbers. Jumpol said that Chiang Mai businesses and organizations were severely affected by SARS effects and more serious problems were looming because 40 percent of the province’s income is generated from tourism-related businesses. "There are many businesses that have closed down or suspended their offices to reduce expenses. If this situation continues like this until July, the tourism-related businesses in Chiang Mai will be in crisis," said Jumpol. The CCC president said that despite the government’s tourism promotional campaign such as "Unseen Thailand" it is not a cure for the problem because the main target groups of some businesses are foreigners who are not travelling as they still fear the SARS outbreak. Udom Maneekhat, Chief of Chiang Mai Provincial Community Development Office, declared that the Community Development Department in co-operation with Siam City Bank Co., Ltd. (Public) is arranging a contest of textile products through the One Village - One Product scheme. The contest is to seek good quality textiles to be promoted into the international markets. The contest is divided into two types of cloth; silk and cotton and the contestants must be producers in the One Village - One Product scheme. The cloth must be 90 cm width and 4 meters length and hand-woven. Production must be at least 100 meters per month. It was estimated that there are over 50 producers from Chiang Mai and 100 from the northern region, said Udom. The contest will help stimulate the textile producers in Thailand to develop their own styles and quality to respond to target group and end markets. The winner from each region will get 100,000 Baht prize. Although China was a rival in woven textiles, Thai woven cloth was still very popular overseas because of its quality and unique Thai style. Europe and America have imported an increasing amount of textiles from Thailand every year. 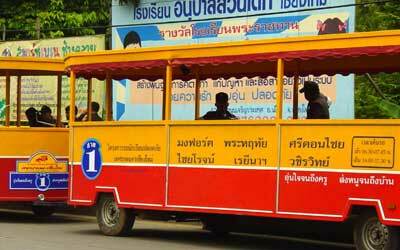 Chiang Mai Municipality has provided two electric shuttle busses for students as a pilot project to attempt to solve traffic jams and air pollution during the rush hours. Electric shuttles wait for students on Chang Klan Road. Boonlert Buranupakorn, the Chiang Mai Mayor officially presided over the opening ceremony of the pilot project on May 19. " I expect that the electric shuttles will take more than 500 students to schools, and this will mean about 500 student’s parents cars will be off the road during rush-hours," said Boonlert. The municipality would provide two shuttles for three different routes around the city, and in each vehicle there were voluntary teachers and municipal guards to supervise the children. The service would start from 6.30 to 7.45 a.m.
After the first three months there will be a fee, but the students do not have to pay in cash, but with recyclable rubbish, which is converted into a cash value. Provisional Second Lieutenant Panyaporn Mongkolcharorn, Head of the municipal technical control, said that besides solving traffic jams and pollution, the officers aimed to reorganize Chiang Mai public transportation system, and they have decided to start with the electric shuttle project. Supak Nakthewan, Phrae Provincial Excise officer, disclosed that after the government launched a policy supporting the local village economy, it allowed people to register to legally produce liquor. Phrae Province used to have conflicts with moonshiners in the past, but after the government agreement, there were 71 lists of names wishing to produce liquor legally. The registration period will take place this month, after which there will be an intensive examination for illegal operations. Aim-orn Promdee, general secretary of Liquor Network in Phrae province, said that the members are farmers and co-operatives groups and some villagers may have problems with documents and regulations. SME’s in the north took advantage of the opportunity to see hundreds of machines, thousands of innovations and revolutionary new technologies at the Northern Region Industrial Expo 2003, where up to 170 local and international manufacturers took part. There were many booths, presenting new technologies in the CMU grand hall. 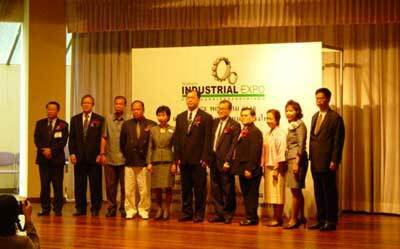 Udom Puasakul, Chiang Mai deputy governor presided over the Northern Industrial Expo opening ceremony at Chiang Mai University (CMU) Auditorium. 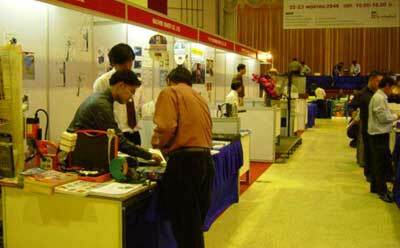 The exhibition had been organized by the Reed Tradex Company and other state and private agencies. It was held at Chiang Mai University Auditorium from May 22-23, and the opening ceremony was presided over by the Vice-Governor of Chiang Mai, Udom Puasakul. The exhibition was prepared to bring modern machinery and technologies for industry to enable the local entrepreneurs to develop their factories and businesses to become leaders in their industries and to support the economic growth in the country. During the fair, there were technical conferences, covering a variety of topics including industry policy, new production technologies and cutting edge strategies for effective business growth in the future. They also arranged special lectures regarding clean technology, purchasing, warehousing, and human resources management. But have they been issued with torches? The commissioner of Provincial Police Region 5, Pol Lt Gen Prung Boonphadung, chaired a meeting to express concerns over the government policy on solving the dark influences in the northern provinces. Around 100 police officers from eight provinces in the upper northern regions in Chiang Mai, Chiang Rai, Lamphun, Lampang, Mae Hong Son, Phayao, Phrae and Nan participated in the meeting. Pol Lt Gen Prung Boonphadung, chairs the conference of police officers. Pol Lt Gen Prung disclosed that in the area of jurisdiction of Police Region 5, they have launched the crackdown operation on dark influences since May 21. The list of influential people in the eight provinces under Region 5 has more than one hundred names, but these numbers need more specific evidence to confirm the named people are really "dark influences" in each area. Pol Lt Gen Prung, said the first targets are gunmen. From there they will look at apprehending the gangsters, gamblers and motorcycle racers. 120 students from 16 Border Patrol Police’s Schools in Chiang Mai and Mae Hong Son received environmental training, under the supervision of the Natural Resources and Environment Conservation Project during May 29-June 1. It was organized by the Environmental Quality Control and Promotion Department in cooperation with Border Patrol Police Commands and HRH Princess Maha Chakri Sirindhorn’s Project Office, and was held at the 33rd Border Patrol Police Head Quarters in Sansai. This voluntary training scheme was aimed to encourage children’s level of consciousness about the importance and problems in conserving our natural resources and environment. The participants were trained to be leaders to conserve and restore natural resources and environment, which in turn would help improve standard of living of people in their communities. Kritsada Todsansin, President of Quality Package Board Co, a Thai-German joint venture, has put forward a proposal to build a garbage recycling plant in Lamphun. This is being reviewed by the officials of Lamphun Provincial Administrative Organization, the Municipality and many other Tambon Administrative Organizations in the province. According to Kritsada Todsansin, the proposed disposal factory works on high temperature incineration which effectively renders the resulting garbage bacteria free. It also reduces bulk, making disposal of non-recyclable waste much easier than at present. With recyclable items, 2 kg of waste plastic is reduced to 2 gm, and iron items are recovered as metal bars and ingots. The plant will recycle daily without air pollution from its high temperature incinerator. Any smoke from it is caught in water condensors and the resultant water is then put through a distillation process, leaving only clean water. To build the factory, the company is asking for 7 rai of land and a 30 year concession from the province. The company will fund the investment itself and after the concession period is over, the factory will belong to the province. The factory will charge recycling service fees equivalent to the current costs to the province. Prasong Tanwattanatrakul, Vice president of Lamphun Provincial Administrative Organization, said that the project was useful for the province and the Provincial and Tambon Administrative Organizations agreed that the best location for the factory was in Tambon Ban which already had a suitable area for the project. During June, the company will present more information on the project to the Lamphun officials. If this factory gets the go-ahead, it will be the first province that has a garbage recycling plant that causes no pollution to the environment. Police officers and volunteers blockaded an illegal sawmilling factory in a National Forest in Phrae on May 21. Pichit Watanasak, the Director of Forest Protection in Phrae, together with some volunteers enetered the Mae Laan National Forest in Long District, and found a sawmill with finished work including 68 pieces of teak wood, and a set of chain-saws, however the workers had fled the scene. "The powers behind the illegal wood industry have changed their target from the deep, wild forest to the conserved ones. This is probably because the deep forest does not have too many big trees left, compared to the conserved ones. Unfortunately there is some confusion about the responsibilities of the forestry officers, so the illegal business owner might take this chance to log illegally," said Pichit. However, the director of the forest conservation management office, Kaipetch Pansomboon, expressed the opinion that the number of forestry officers had decreased in line with the budget restraints. Consequently the general public and state officers should cooperate to cut down the illegal tree felling businesses. In this region, most of the illegal agents and northern "influential people" have been involved with destroying natural resources, invasion of public areas, contraband networking, and illegal bidding, said Pittaya Jinawat, the director of Northern Region Office of Narcotics Control Board (ONCB). He said the ONCB officers had analyzed the drug syndicates networking data, finding there were many gangs involving in drugs and there are new underground agencies including local Mafias, corrupt politicians and government officials, criminals, gunmen, and money laundry networks. Some of the dark influences have connections with transnational crime, illegal networks and also financial and law consultants that all make the suppression even more difficult. Director Pittaya said that in the past, the ONCB officers focused mainly on the drug producers and dealers, but could not eradicate the entire drug networks. However, after Prime Minister Thaksin Shinawatra had launched the policy on suppression of dark influences, the officials are more confident in the operation and there was now cooperation in eradication of drug syndicates as well. In the first period of the new policy, the influential figures were gamblers, hired gunmen, providers of prostitution, illegal traders, illegal lottery, illegal taxi queue mafia, corrupt government officers and politicians. The director demanded the police and other government agents in the area cooperate in getting rid of these Mafia figures or Godfathers. The central ONCB units are always ready to support the operation he said. Recent four explosions near Tachilek border town and checkpoint, opposite the Mae Sai border district of Chiang Rai, did not affect the delicate balance of Thai-Burmese relationships. The situation is back to normal, and the border checkpoint for trade and tourism is still open, according to Decha Sattaphol, the Mae Sai District Chief. 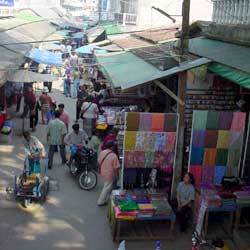 The Tachilek province of Burma is always crowded with shoppers. Will it be subject to terrorist attacks again? He said that the Burmese authorities have already asked for cooperation from Thailand to help search for the suspects who may have fled into Thailand, and the Thai authorities have also stepped up security measures, along the borderline. The first blast took place about 3.40 a.m. close to a gas station. The second and the third bomb blasts occurred at 6.30 a.m. and the last blast went off at 8 a.m. inside Burmese territory and not far from the Mae Sai border checkpoint. Pachara Sinsawas, head of Mae Sai Customs Office, said the situation at the Thailand border is as usual and the border checkpoint has not been closed, as it was considered that the bomb blasts were the result of internal Burmese conflicts. Pachara also added that after the explosions, Thai officers had been invited for talks with Burmese officers looking for solutions. Gen Somtad Auttanan, the commissioner of the Royal Thai Army, said Thailand was ready to tighten up border security if required. 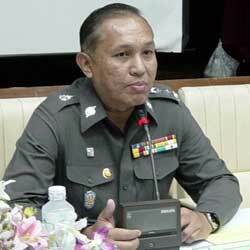 The Commander of Chiang Rai Provincial Police, Pol. 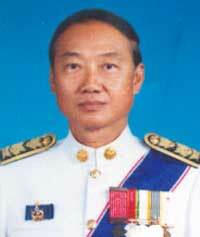 Maj. Gen.Wuth Withitanont said that according to the government’s policy to counteract "dark influence", the definition of "influential person" meant someone who broke down the social order, economic status, and politics of the country, but the petty offenders or assassins did not come under this definition. "If I have any proof, I am sure that those people will be arrested. However, influential people are not the same as those guys. They stand behind government’s officers or any powerful person for the purposes of breaking the law. This is the reason why we can not find any evidence to pursue them," said Pol. Maj. Gen.Wuth Withitanont. He was pleased to report that at the moment, drug suppression in Chiang Rai was succeeding, through the good cooperation from the state and private sectors, with the Chiang Rai police recently receiving an award from the Ministry of Interior. A well known cattle trader from the Salween river basin committed suicide near his own cattle pen. The man had lost 10 million baht due to the government’s policy on closing the door to Burma to block drug deliveries, but that also blocked him from importing live stock. Pol. Col. Kasemsak Surawanich, superintendent of Mae Sariang Police Station and his team were informed that there was a body under Huay Jom bridge on Rim Klong rd., Ban Pae Ka Puand, Tambon Mae Yuam, Mae Sariang district, Mae Hong Son province. The body turned out to be that of 60 year old Boonsee Ruangdang which was found lying on plastic sheet with a liquor bottle and Rannet pesticide. The police found 100 baht cash in his wallet with no evidence of criminal intervention. The case has been assumed to be that of suicide. Pa Namsamai, a cow herderer said that the night before, Boonsee had bought alcohol for his friends but did not drink with them. Around 10 pm, Boonsee rode off on a motorcycle and was not seen again till his body was found the next morning. Boonsee was a cattle trader who had been importing cows from Myanmar through the Ban Sao Hin border pass in Mae Sariang district for several years. Since last September, the Burmese government had controlled the border and the Thai border gate was blocked for the drug syndicate suppression. The old merchant could not continue his trade and had lost 10 million baht before the business was closed down. Chalermpol Prateepavanich, the governor of Lampang, revealed that although the campaign to uncover influential people involved in crime was one of the most difficult and delicate ones, he was not going to give up. He had ordered questionnaires to be distributed to the public, looking for information on influential people in Lampang. Those "influential people" being looked at in this questionnaire, were those who were involved in gambling, hired gunmen, human trafficking, money extortion, blackmail, illegal trade, underground lottery, betting, even taxi queues, including the dark influence of surreptitious government officers and politicians. Already his officers have received much information about the illegal lottery businesses, apparently established in every sub-district, plus 22 gunmen for hire and 5 illegal employment agencies. "After my meeting with the Prime Minister, I would commend every sheriff and superintendent to take appropriate action against those people," said Chalermpol.